It's annual UN World Autism Day, April 2nd today, although the National Autistic Society have stretched it into a whole week this year. As Tania has done the awareness day post for the past few years, this year I'm excited to be taking my turn at our SNJ contribution to the day. I'd like to share with you all our recent experience on training an Autism Assistance Dog for Monty. Having tried countless things over the years such as a weighted blanket, a clock that tells my son to stay in bed, a specialist knife and fork set, private therapy, a wobble board, chews, special boots, a sensory den… and I'm 'sensing' many of us have tried similar "solutions" probably with varying degrees of success. But the one thing we felt would help more than anything was a service dog. Our son was a ‘runner’ and we felt it would help calm him down in times of stress. I’d heard about the benefits of an assistance dog for autistic children a few years back when they were featured on The One Show. I looked into the possibility, but we lived too far from the training centre to be eligible and even if we were eligible there was a waiting list of about four years at that time. We were gutted! However, we were advised that the charity Dogs for the Disabled had picked up on the benefits of dogs for children with autism. Dogs for the Disabled's innovative PAWS programme has developed the training of assistance dogs to work effectively with children with autism. They've seen how there is a special chemistry between the dog and many children with autism, with the dog having an incredible calming effect when a child is angry, anxious or distressed. They can distract a child away from disruptive or dangerous behaviour and create a space for the parent or carer to take control of a situation. They realised that while for some there will always be a need for a fully-trained assistance dog, a well trained family pet dog can also have a massively beneficial impact. At that time we didn’t have a dog but we jumped at the opportunity to attend a PAWS workshop and what a fantastic course it was. I learned so much about dog behaviour, breeds and what to look out for if the dog was becoming upset or anxious and how to deal with it. They also explained how to introduce the dog to autistic behaviours and to carry out some really good training ideas that would suit our family. We were smitten with the idea and there was no way we weren’t getting a dog after this. The benefits were evident immediately and Monty really took to having a dog, his favourite pastime quickly becoming sucking her ears and she didn’t mind one bit. She was easy to train too and learned very quickly how to do a ‘head rest’ which helps a child stay seated at the dinner table and how to wait outside the toilet door when Monty used the toilet, as this helped reduce his anxiety at being upstairs. The after-support from the PAWS team has been fantastic too and they are on hand to help with any problems. There is also a PAWS Facebook forum to share stories, videos and problems. But what if you are one of those families who really require a fully trained service dog? Where do you go then? We decided not long ago that as our son's anxiety had reached an all time high, (I couldn’t even put the rubbish out or go to the toilet without being followed or Monty going into a hyper-vigilant state where he would start self-harming) that maybe we had reached that point. It was then I heard via a friend about Service Dogs Europe. They provide a fully-trained Assistance dog for a variety of disabilities and disorders and while there is a cost involved, they also provide ways to be able to fundraise so a dog can be yours within six months. They also take your own pet dog and will assess them for suitability as an assistance dog too. Although there were no promises that she would pass the assessment, we decided we had nothing to lose (other than the cost of the assessment, but we had some money saved up), so we filled in a self referral form from their website and heard back within the week. At the same time, a friend of mine had applied for a puppy through Service Dogs Europe and while we were waiting for Nisha to complete her assessment, their dog was ready to join their family and after three days intensive training at the family home, they had their service dog. 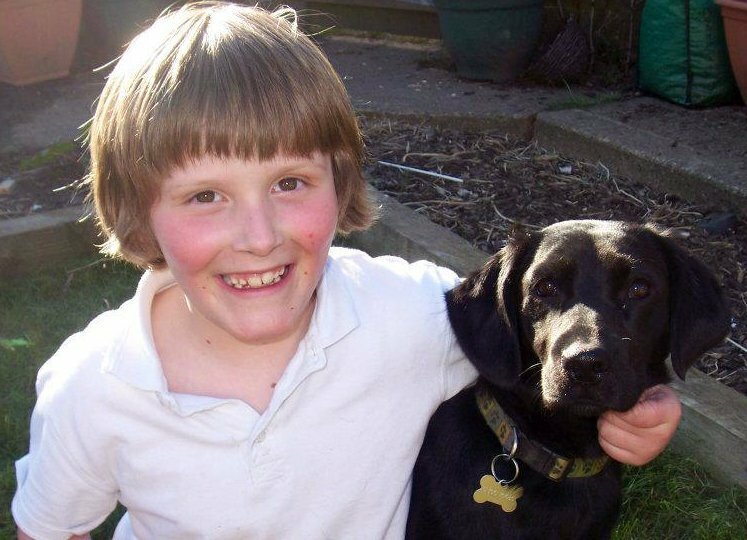 “Our dog has made a very positive difference, my son, who is autistic, will stop what he is doing constantly to go and find comfort and security in touching her fur. It's lovely to hear him say things like "I love you" to her , and "She's looking at my eyes! I'm looking at her eyes!" The dog is the only family member who might come close to resolving a meltdown, and helps settle life's hurdles such as bathing and toileting…the things that took a lot of convincing before are now that much easier if the dog comes along too. While these may be the benefits of having any pet, the difference with a service dog is firstly that I know I can trust her 100%, no matter how loud, how rough, how constantly in her space my son chooses to be. "I know this dog has been tested over and over for aggression in a variety of settings, so I have peace of mind. I am slowly able to ditch the use of a special needs buggy too as my son's confidence increases. "There is still some anxiety, but it's less obvious. I sense it as his Mother and remain on alert, but anyone else would simply see a boy and his dog, without any cares in the world, which of course makes us more approachable. People stop to talk and ask about the dog, allowing my son the chance to have a voice and interact socially about something he loves." Sadly for us Nisha did not pass her initial training; she was too unpredictable on the lead with other dogs and despite their best efforts, Service Dogs couldn’t train this out of her, so we are still waiting for an opportunity for Monty, which is likely to be some years in the future and therefore we are looking at other ways we can support Monty with his anxiety. SEND reforms: Why working with parents means taking a walk in our shoes.